We are today @ Meghalaya, literally meaning abode of clouds(Megh=clouds, aalaya=abode/temple). People remember Cherrapunji more for it is credited as the most wettest place on Earth, with rain-fall all year around. Shillong, the capital of meghalaya is a well-known tourist location and is called the Scotland of the East India. Coming to their cuisines, they eat everything! yes, Fish, fowl, pork!! But cooking is simple like other NE states, less spice, less oil. Food is mostly prepared by boiling with herbs, steaming, cooking in open fire. So, again looking for vegetarian recipes was a bit tough, until we know what they are called in the local dialect. yes, if you are familiar with the names, it is a bit easy to search for the recipe. The Khasi/jaintia cuisine, refered by their tribal name, revolves around few staple flavors like mustard oil, black/white sesame paste, fermented beans/fish. Where rest of the India finish their festive meal with rice as the main course, the people of Meghalaya favor rice for their everyday snack/breakfast/lunch and for each and every occasion , of-course with meat along. Rice cakes are many and there is different type of paddy, planted for rice cakes. The common cakes are Pujer, Pu-syep,Pu-tharo, Pu-maloi, pu-nei, pu-khlein, pu-niang, pu-saw, pu-nianghali. For all these preparatios, rice has to be first soaked, dried and pounded. 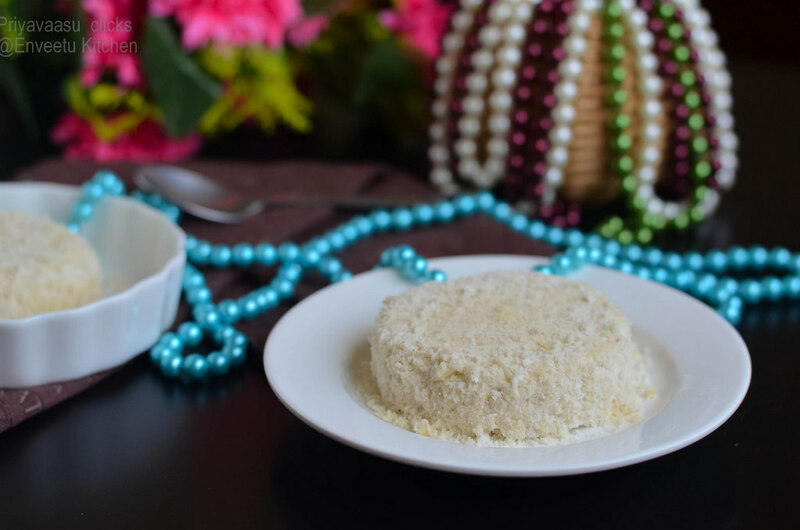 Pu-jer is fine powdered rice eaten at special ceremonies like marriage, naming,etc. 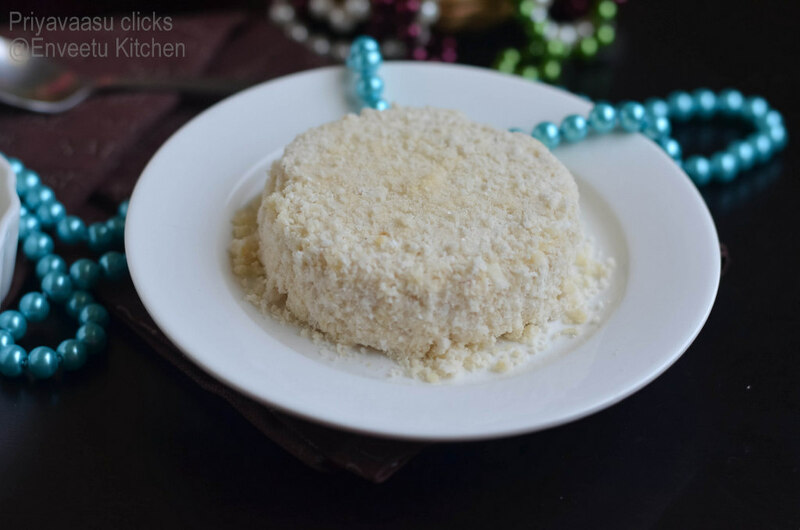 Pu-tharo - Rice is first modelled in an earthen dish called sarrow and then baked. Pu-saw - is similar to putharo, except a little baking soda is added to the dish. Pu-nei is a khasi namki, a deep fried snack with some local herbs/spices called jhiras added. Pu-khlein is a deep fried snack, made of rice flour and jaggery and fried in Lard/Pig fat. These are local delicacies which can be found on the streets, wrapped in banana leaf sold as breakfast by the kongs(ladies). Pu-tyndong is rice packed in a bamboo stick and baked in a open fire. I used store-bough rice flour,so i dry roasted the flour for 2 minutes, until it was hot to touch. Let it cool and then proceed to make the putharo's. 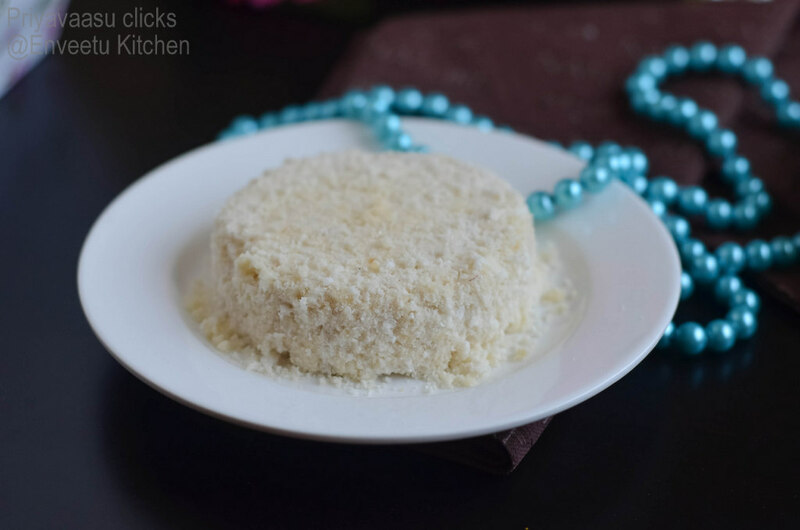 If using home-made rice flour, then skip the above step. 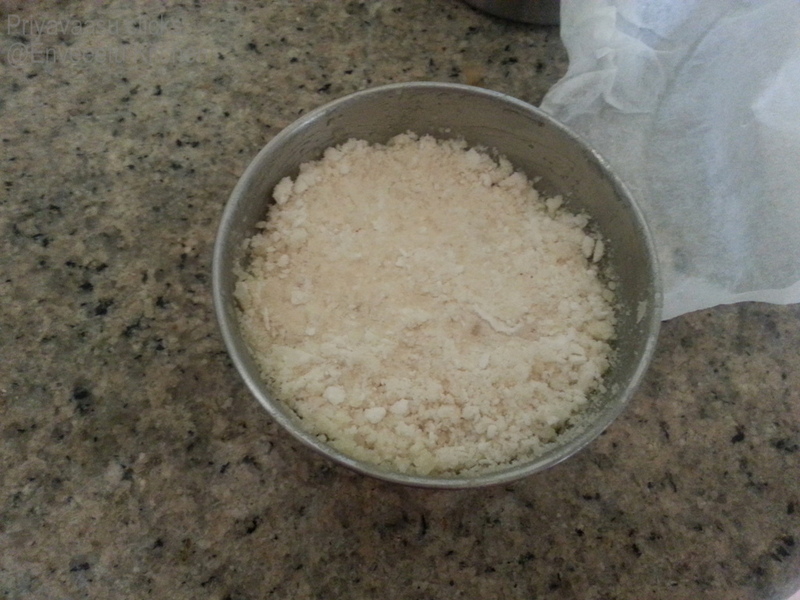 Take the rice flour in a flat plate, add salt and sprinkle warm water 2-3 times and start mixing the rice. you should be able to hold the flour in your fist and when pressed, it should hold shape and when crumbled it should crumble well. Add jaggery and fresh coconut, mix well. Take two small bowls/silicon moulds or a flat earthen ware will also do good. 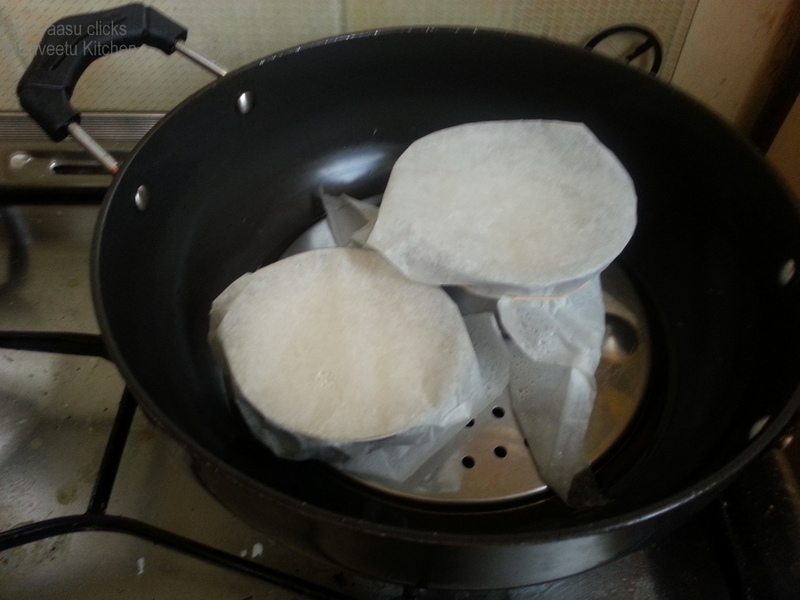 I used two steel katori's/bowl, grease the bowls, fill the bowls with the rice flour mixture. I filled till half their capacity. Cover the bowls with a piece of parchment paper, to avoid water dripping into the bowl while steaming. Steam cook for 10-12 minutes. Remove from the steamer, let it cool for 2 minutes, the carefully unmould it on to a serving plate. Serve Warm. Wow Priya, you have done putharo prefectly, looks like you know their language now, loved the way you prepared this dish without any recipe but with the author's reference. That surely looks very tricky priya..glad you got it right..love your presentation..
you have presented it so well.. looks very tough and tricky!! Thoroughly researched state looks like, Priya! Great find. 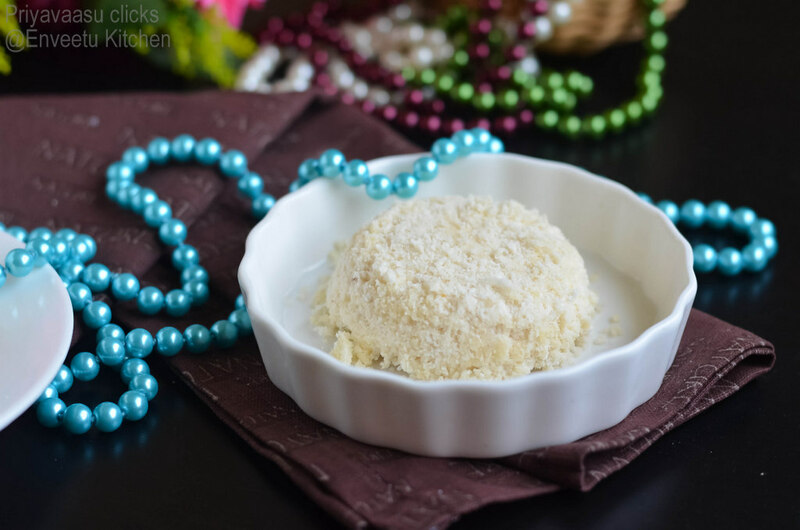 Looks like puttu from Kerala, right? love those pretty pearls.. love the steamed rice cakes too.. would be lovely for breakfast. You do deserve a phd on this cuisine.. :) I specially liked your reason for why you think you got the recipe right! That is indeed lot of research behind the scenes to be so sure you nailed hte recipe. 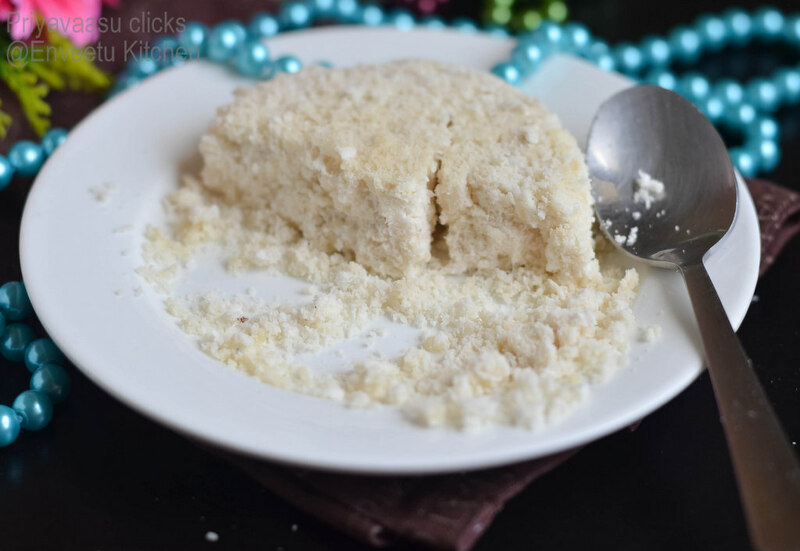 :) Lovely clicks and a nice recipe. Like Usha said you are Dr. NE states. Loved the write up and I was giggling when I saw your reason as to why u got the recipe right. Thumbs up Doc!